Well, I can now put another notch in my dragstrip belt. My first trip to Island Dragway in Great Meadows, New Jersey for the Funny Car Showdown as noted in the title. The track has been around well over 50 years and actually closed a few years ago only to be resurrected by Carl and Melissa Milano. The track has undergone some renovations and I’m sure more are on the way. The track itself is nestled in the middle of nowhere in Great Meadows, New Jersey. 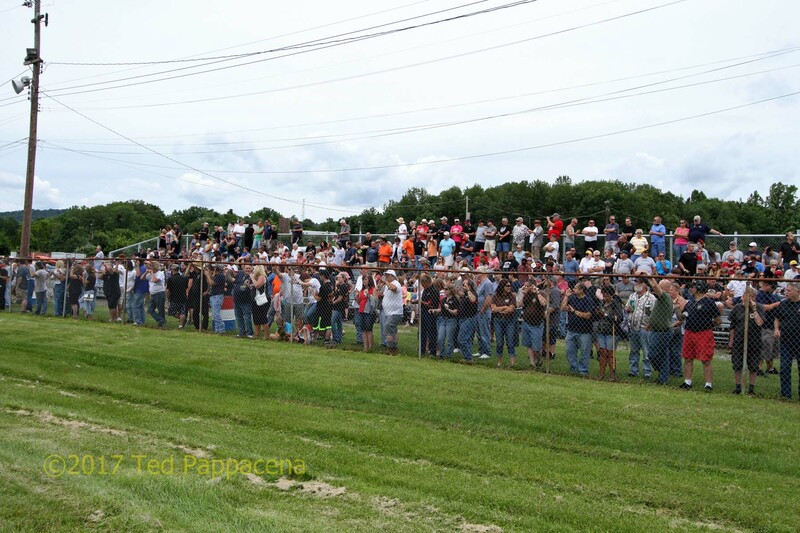 This is a good thing as there should be no complaints about noise as that is something that plagues other tracks like Raceway Park in Englishtown, New Jersey. 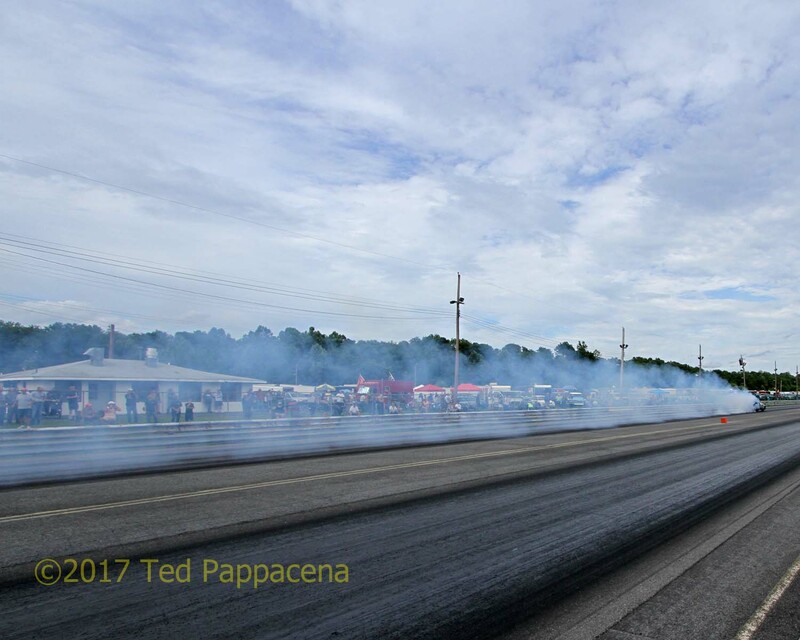 Island Dragway is famous for the record setting 200 mph pass by Don “Big Daddy” Garlits in 1964. The first “official” 200 mph pass recognized by the NHRA. I believe in 2013, Al Hanna‘s jet dragster went 300 mph there too. Upon entering, I was welcomed by race cars on both sides of the pits for as far as the eye could see; Funny Cars on the left and N E T O and MANDRA cars on the right. 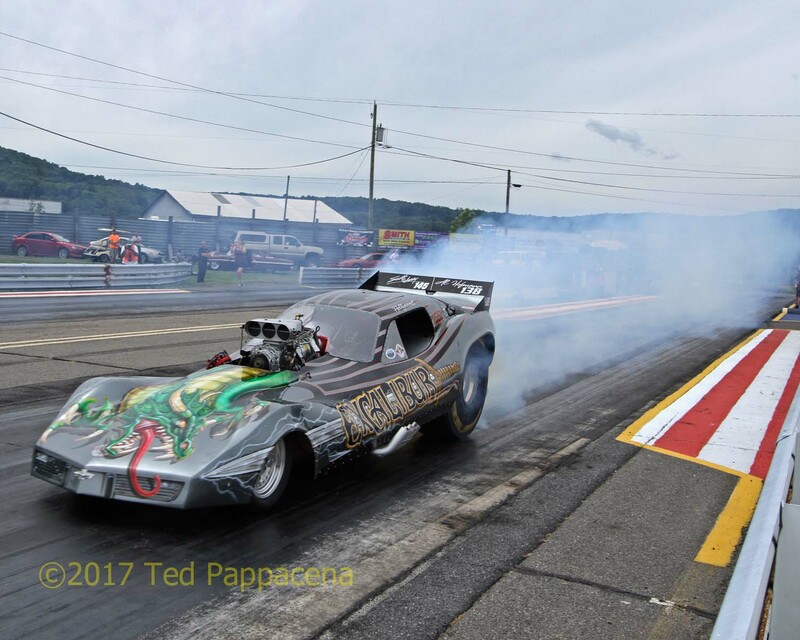 Now, I missed Denny Salzwimmer’s recent funny car extravaganza at Pittsburgh International Raceway in July. Denny was the first person I saw and talked to after getting my neon orange media vest. From that point on it was almost a blur regarding all of the racers I spoke to and photographed. 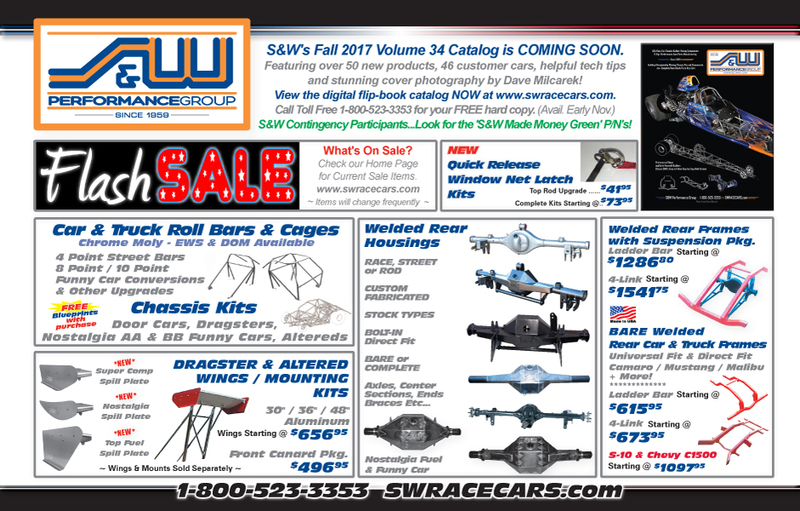 As advertised, these are the nitro cars that were in attendance; Bruce Larson’s U S A-1 70 ½ Camaro, Rocky Pirrone’s Frantic Ford Mustang, Chuck Exton’s Wild & Crazy Mustang, and Keith Davidson’s Bits & Pieces Firebird. The alky contingent consisted of the following; Chris and Krista Masserella’s Temporary (injected) and Total Insanity Monzas, Rocky Pirrone’s Super Camaro, George Reidnauer’s Excalibur Corvette, Frank Barnard’s injected Poison Arrow, Willie Johnson’s injected No Money No Funny Nova, Robert Daly’s injected War Horse Mustang, the Time Bomb Vega, the Sweetman Brother’s Citation, and John Cerchio’s War Path Buick Regal. Also in attendance and presumably an alternate was Kevin Johnson’s Quarter Pounder Firebird. Also on hand were 2 alky fuel altereds; Mike Geroni’s Fiat and Terry Smith’s Yellow Bandit. Presumably, they were to match race each other but Geroni’s Fiat broke after a burnout and the Yellow Bandit made a solo and then ran one of the alky F/Cs. Excalibur Corvette leaves a trail of dragon smoke during its burnout. A broken fuel pump put out the dragon’s fire in the final. The two best ETs from round 1 would determine who would race who in the final. Chris Masserella in the Total Insanity Monza by virtue of a 6.92 would face off with George Reidnauer’s Excalibur Corvette. It was somewhat anti-climactic as the Excalibur lost its fuel pump after the burnout and had to watch as Chris soloed to a 6.87/196.5mph pass for all the marbles. Chris also garnered the S&W Longest Burnout award as well. His almost full track burnouts were pretty much uncontested. Not a track overview shot! I promise there’s a funny car in front of all that smoke. This is why Chris Masserella swiped the longest burnout award given by S&W Race cars. The injected portion of the event was run the same way as the blown cars. Willie Johnson took on Krista Masserella and Frank Barnard took on Rob Daly’s War Horse in the first round, with Willie and Frank advancing. 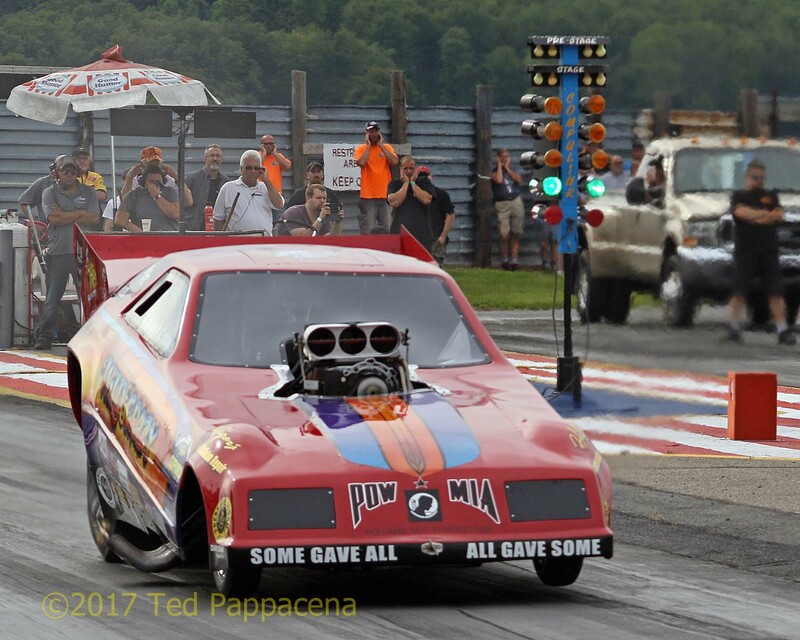 In the final No Money No Funny lined up against the Poison Arrow and Willie streaked to the win with a 7.86@167mph. Willie has a virtual lock on this category in whichever race he competes at. The nitro portion of the race was confusing to me. There were 2 rounds for them as well, but Exton’s Mustang and Davidson’s Firebird ran the full quarter as opposed to Bruce Larson and the Frantic Ford running to 1000’. So low E Ts for overall winner were determined, how? I don’t know but Chuck Exton blasted out an ungodly (no pun intended) 6.66/208mph pass. Ungodly too because as Chuck will tell you “that b#%ch” has a cast iron truck block motor. Quite an achievement. The race went off without a hitch. No incidents that I saw and only 2 funnies got a little squirrely at the top end in the right lane. Kudos goes to the Milano’s and their staff for putting on a safe and efficient race. As far as I could see, there wasn’t a frown to be seen anywhere. I am eagerly looking forward to next year’s edition. I heard that it will be even bigger!